Home Cats Scratch and Climb The favorite scratch material of your cat? The favorite scratch material of your cat? and in what direction? There are scratching posts and scratching objects available in different materials. You do not know which one to choose because you only just adopted or did not have the chance to offer her all the materials yet? What is your cat's favorite scratching material? And does your cat prefer to scratch horizontally or vertically? 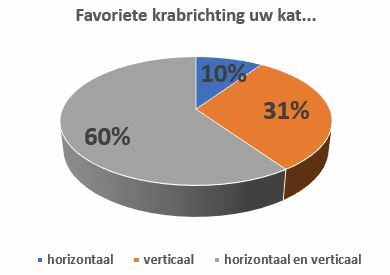 It is obvious that most cats (60%) prefer to have both horizontal and vertical scratching options. At least 60% because still a lot of cats don't have both options available. 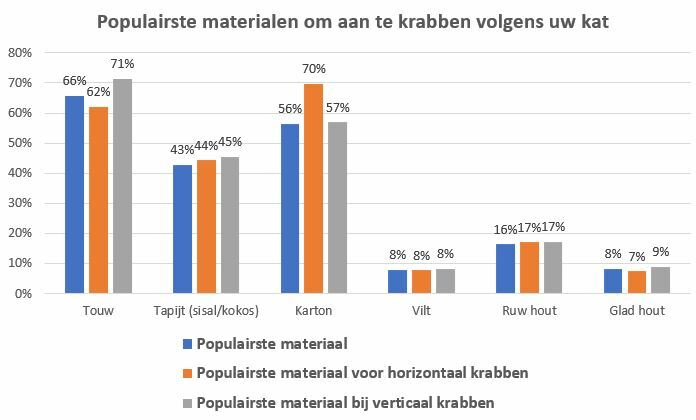 If we look at all that prefer vertical scratching: that is 90%! As expected, because in nature they scratch trees. A big part of the other 10% will be old cats, because almost 80% of old cats have artritis and when it is severe, they will avoid pressure on their hips and hind legs. 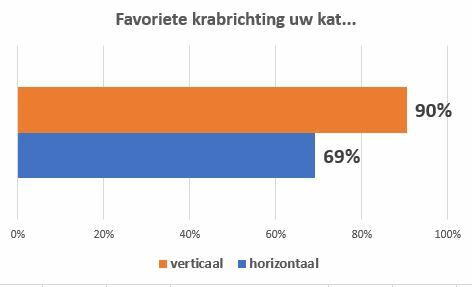 Possibly more of a surprise for a lot of people is that almost 70% also prefers to scratch horizontaly. While classic scratching trees almost exclusively concentrate on vertical scratching. Summarizing: Both horizontal and vertical scratchers should be available for cats in their home to meet their needs. The classic materials als rope and carpet. But here you see clearly that cardboard has passed the carpet! So the top 3 for the modern housecat is (1) rope, (2) cardboard and (3) carpet. But availability also naturally influences the results. Cardboard scratchers are less available for vertical scratchers and rope is always the most available in the traditional trade for vertical scratchers. Felt is less popular. Possibly because it is a newer material for this purpose, but we do advise to test if your cat wants to scratch felt before investing in scratching furniture in felt. You can test this by buying an economical felt scratcher or mounting a piece of felt to a piece of wood as a tester. What seems surprising is that rough wood is low on the popularity scale, but... indoor cats often do not know that material. For polished wood it is clear that it is not so popular, because every cat has door frames and table legs available. Summarizing: as you can see the sum of rope, cardboard and carpet is much more than 100%, this means that most cats like to have the different materials available in their home. If you also want to offer felt or a real tree, best do a test first. Note: Although the sample size is sufficient, this is obviously not a scientific study. For that purpose, among other things, all cats should have been offered all the materials in all direction for a certain period of time and it should literally have been counted how often they scratched each. But the experiences and observations of the 'owners' are therefore no less valuable to sketch a good picture and give you an idea which choices are popular with most cats.